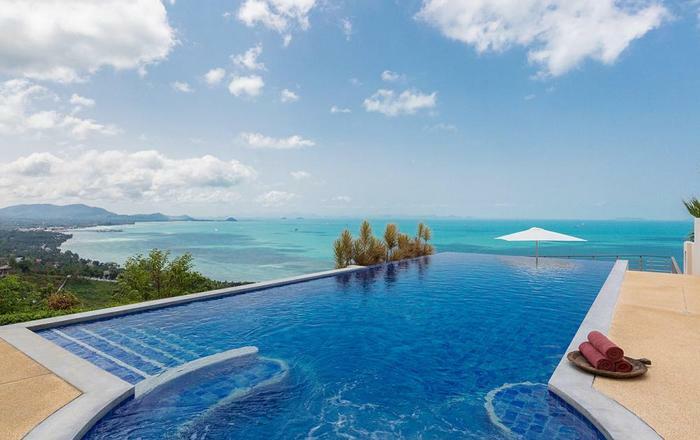 Occupying a dramatic clifftop setting, this luxurious 7-bedroom (plus two kids' bedrooms sleeping 8) Koh Samui villa offers a stunning spot overlooking Chaweng Bay. 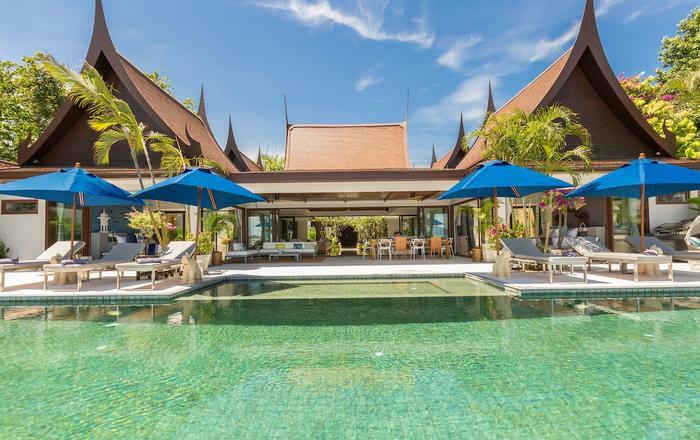 The villa feels like a rustic Mediterranean country retreat, fusing Asian and European design into a striking property sleeping 14 adults and 8 children. Outdoors, multiple lounge and dining areas surround a vast lawn and infinity pool. Indoors, a mezzanine-level study, and huge living space with foosball and pool table add group-friendly extras. Natural light floods into an open living/dining area with double-height arch windows and soaring ceilings. Oversized couches offer a chilled spot for group chit-chat in this expansive social space. Share sit-down means around a unique driftwood-inspired dining table, offering comfy seating for 22. The nearby beach-style wet bar offers a casual spot for evening cocktails, while a pool table, foosball table and dartboard are on hand for group entertainment. The exquisite country-style kitchen is a work of art, outfitted with high-end Smeg appliances and a gleaming white island. Though your personal chef will do all the cooking for you, the kitchen is a great social spot. Sneak off for a spot of reading (or cheeky afternoon nap) in the mezzanine-level office - complete with an inviting bespoke couch, book-filled shelves, and desk area. Below the main living pavilion, a multi-purpose room with an en-suite bathroom can be used as a TV lounge, additional sleeping area for the kids (it has four single beds), or even a massage room to ease you into a state of zen-like holiday calm. The grounds of this property are truly sublime. 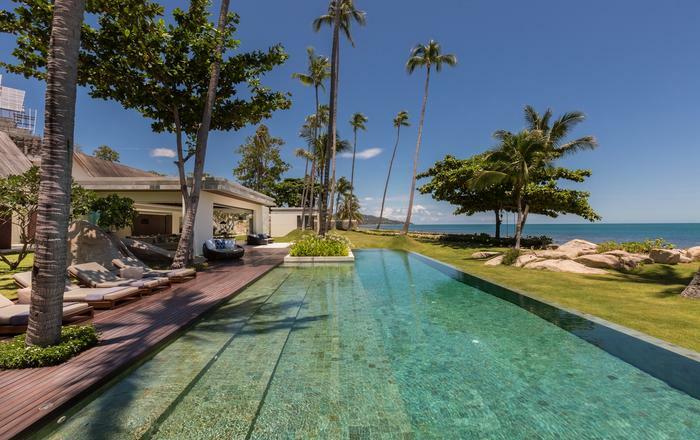 Rolling lawns lead to a clifftop infinity pool, flanked on either side by a shaded pool lounge, and a dining sala. Come evening, the cool breeze and spectacular sunsets make alfresco dining essential. Enjoy privacy closer to the villa on a travertine-clad terrace. Spent a day lounging on the beach? Brush off the sand and fire up the grill in another terrace off the kitchen. It's the perfect spot for lazy lunches and seafood barbecues while the kids giggle and splash in the pool. A garden below the pool offers more space for family fun. Bring out your competitive side with a tournament on the petanque court and golf putting green. A private fitness center in this area helps you burn off all of that delectable Thai cuisine. And it's air-conditioned, so you won't burn up in the process. Stay up late for stargazing around the pool...or call it a night and slumber in one of the villa's nine bedrooms, each with its own en-suite bathroom. Pick of the bunch is the master suite, boasting ocean views from a king bed, and a private terrace with an outdoor shower. A deluxe en-suite bathroom features a dual-sink marble vanity, and double rain shower. The remaining bedrooms are housed in four separate pavilions. Queen beds feature in four of the bedrooms, and two additional bedrooms have twin beds. All have a private terrace with outdoor seating. If you're bringing children, they'll love camping out between two bedrooms with four twins each. 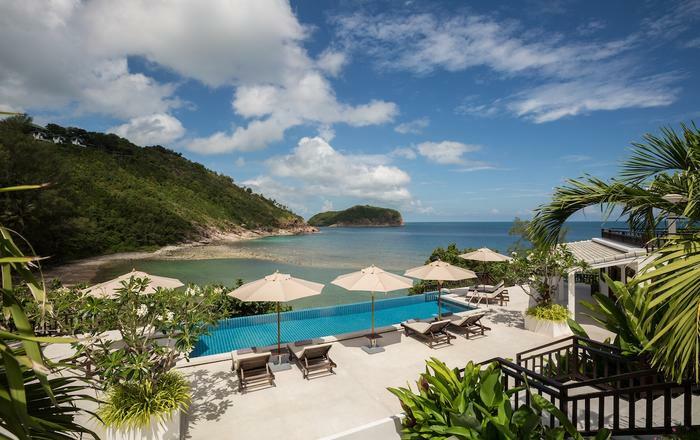 This clifftop retreat is wonderfully secluded, but it's only around a 5-minute moped ride to the beach, bars and local markets - ideal for picking up fresh ingredients for dinner. Travel just 3 km to the town of Chaweng (great for nightlife), or head 7 km to Fisherman's Village for shops, bars, restaurants and a lively weekend market where stalls take over the street with a mixture of gifts and street food. On behalf of the whole party this weekend, I wanted to say thank you so much to yourselves and the team. Our time at Koh Koon was phenomenal, it is truly a beautiful villa, the design and attention to detail is fabulous. However, it is Praew and her team who make it perfect. They are so attentive and took care of everyone from the baby, to my 82 year old mother! And the chef is incredibly talented - we all loved the food and eagerly looked forward to each meal. We’re all heading back to Hong Kong a little plumper but definitely a lot more relaxed! Thank you once again for your help in booking everything and please thank your team on our behalf. Thank you so much for the great hospitality! We had a fabulous time. Hope to be back soon! Thank you for making our stay so wonderful. we couldn't of ask for a magical wedding! The way you took care of all our needs - we cannot thank you enough. 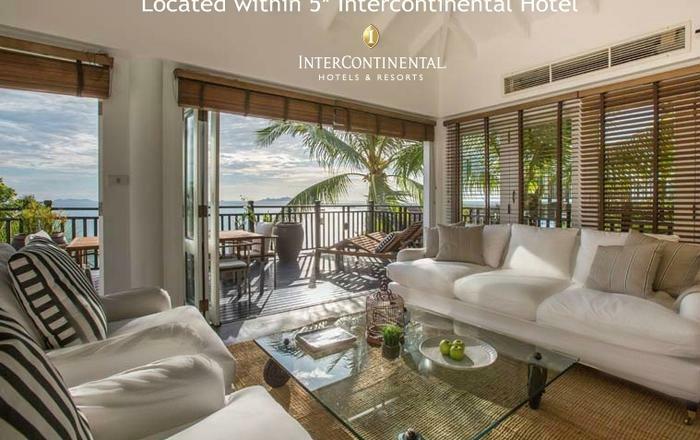 Koh Koon is a beautiful location but it is your team that gives this place it's heart. We will always hold you close as without you, our wedding would not of been everything we had dreamt of. We had the very best time! Having been invited to our niece's wedding, we decided to make a family holiday out of this. We had 10 adults and 3 very young children in our group, and Koh Koon was just perfect. The individual accommodation is dotted around the property, and a beautiful King size room is located inside the main house. We were the only people there, as this is like a family or friends type of villa, and the wonderful staff took care of all of our needs, without ever being intrusive. The villa manager guides her staff well and everything flows beautifully. The chef, was amazing. He prepared breakfast lunch and dinner for the 13 of us everyday, and his food was top quality. The rooms are very comfortable and all have good air conditioning, and views of the water. There is a large infinity pool at the lower end of the property and we spent many hours in this just enjoying the view, and playing with the children. The main house has a pool table, foosball and a large dining table. The holiday was unbelievable. The property and staff at Koh Koon was first class and perfectly suited for our 3 families. 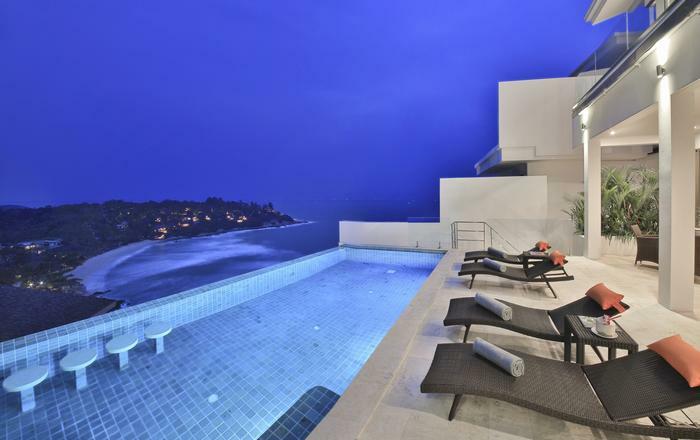 It was a holiday of a life time in a dream house with dream views and fabulous amenities. The villa was well positioned, with soaring views over the beautiful water below, but within a 5 min moped ride to beach, bars and markets. The villas decor was stunning and very calming with the neutral palette and french feel. The facilities were excellent - the bar by the pool was brilliant and suited our afternoon drinks perfectly. The staff were brilliant and the chef was amazing - the best Thai food we had in Koh Samui....in fact anywhere.